When was the last time you bought something significant without checking customer reviews? For consumers, consulting reviews has become second nature when making an important purchase. Increasingly, this behavior is carrying over to business purchases as well — nearly 50% of B2B buyers now use reviews before selecting new products or services. It is clear that reviews have become a critical part of the B2B purchasing process. But you don’t have to passively wait for customers to review your products and services, nor should you leave it up to your buyers to find the reviews on their own. You can capitalize on this trend by including reviews in your marketing strategy, and ultimately building a stronger, more trusting relationship with current and future customers. 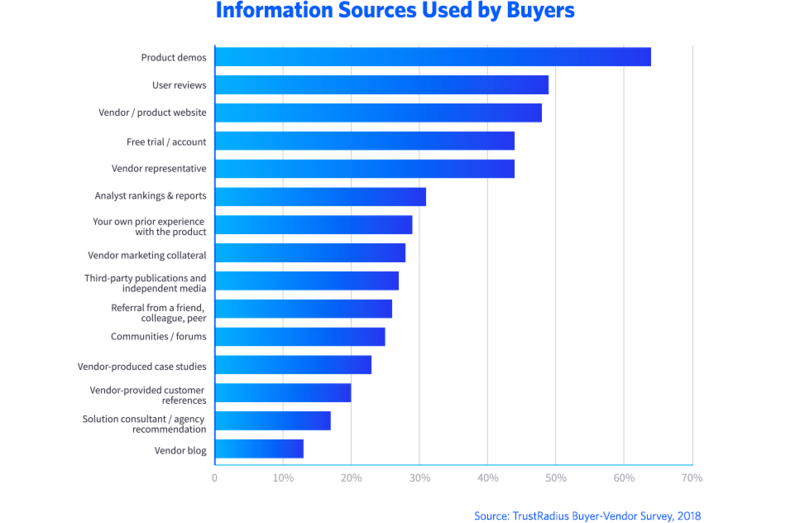 According to a recent study conducted by TrustRadius, business technology buyers use on average five different sources of information to research and evaluate products before making a purchase. Reviews are one of the most widely used resources. Hands-on experience, in the form of product demos, came in first, followed by customer feedback from user reviews which came in second. Another TrustRadius poll revealed that 76% of respondents in an active buying cycle used customer reviews during their decision-making process. Why are reviews so influential? Buyers want unbiased insights from people like themselves. Peer reviews provide a unique and trustworthy perspective on what it is like to use your product every day. This is especially important when they are purchasing business technology that can cost upwards of $100k per year. Buyers know they can't afford to ignore user reviews -- and neither can you. Read on for five ways to be proactive and incorporate customer reviews in your marketing strategy. Let’s start with the obvious. To ensure buyers can find the user feedback they are looking for, Customer testimonials should be featured on your website, landing pages, and marketing assets, though this will likely require permission from the review site. Review content that goes into detail about the customer’s specific use case and the overall pros, as well as the cons of your product, is ideal. More info about which reviews resonate with buyers here. If you are courting new prospects, you’re likely sending lots of emails to teach them about your offering and pique their interest. All promotional emails should include customer reviews about real experiences with the product. Hearing straight from users themselves is a lot more compelling than pure branded messaging and gives prospects a sense of what it would be like to use your product and join your customer community. Disgruntled customers do not shy away from airing their grievances in public. Therefore, the marketing team should make a point to watch third-party review sites relevant to your industry regularly. This way you can engage with those who have complaints, offer guidance to those who may have had a bad experience, and publicly explain how the company is working to fix the problem. Reviews can give potential customers a more complete picture regarding whether a product will work for them or not. Even reviews that share negative feedback can have a positive impact by reducing the number of work buyers have to do, fostering trust, and helping them feel confident they know what they’re getting into. Sales representatives can share favorable and unfavorable reviews during product demos to help explain the limitations of the product as well as overcome objections. This step keeps customers from having to do all the research legwork themselves while also building trust. If you have managed to find users who are in love with your brand, invite them to advocate for you by writing a review. When someone is satisfied with the results they’ve achieved with your product, they are likely to be willing to share their success and lessons learned along the way. This is the perfect recipe for a review. But you can’t expect them to do it on their own, you have to ask! Otherwise, you’re leaving about half of your potential advocates on the table. It is not easy to cultivate invested customers, so when you do, invite them to be involved as much as is appropriate. You might even allow them to guest blog or encourage them to share their experiences and their review on social media. In today’s review-heavy marketplace, it is impossible for businesses to capture the eye of potential customers and keep their trust without acknowledging customer feedback. Letting buyers see what others are saying about your product shows that others have put their trust in you —and were satisfied— and also tells them you are not afraid to let them peek behind the curtain to see what working with you is really like.